Whether you’re a cord cutter, a cord never, or a pay TV subscriber who still wants access to all your favorite streaming services, Roku is the way to go. Roku devices are the world’s most popular streaming boxes and dongles for a reason, and it’s because they’re awesome. They offer access to thousands of services and channels in a terrific UI, and they’re affordable to boot. 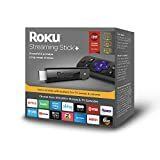 But if you thought Roku’s products were affordable before, wait until you see Amazon’s current sale. The nation’s top online retailer has slashed 20% off the price of the Roku Streaming Stick and 23% off the price of the Roku Streaming Stick+ with 4K and HDR support. Grab one now while you still can!